Does everyone have a thing they get a little crazy about buying for their home? My mom’s thing for a while was sheets, she loves to get new sheet sets; my grandma’s thing is definitely towels, same story. I never thought I would have that same housewares need but while walking through Sur La Table recently I did find myself hankering for some kitchen organization. 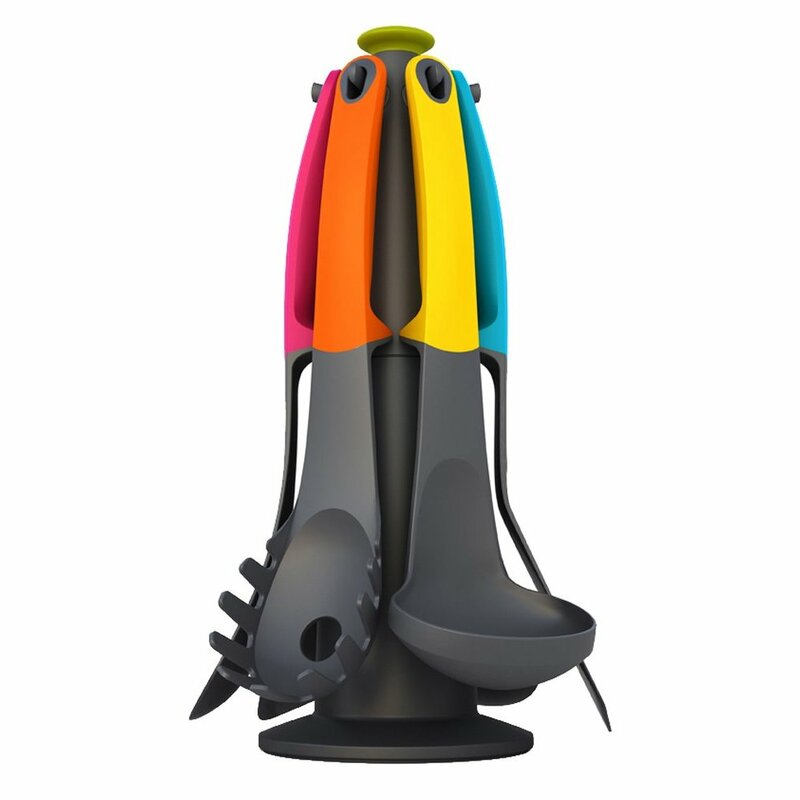 And not just any kind, the kind that would give my kitchen some kitsch: some clever design, some bright colors, some “ooh” and “ahh” to go with the “yum”. And that is how I came to find Joseph Joseph, a kitchen design company owned by two brothers out of England. If you keep a Kosher home, which I don’t, but if you do, this is genius! 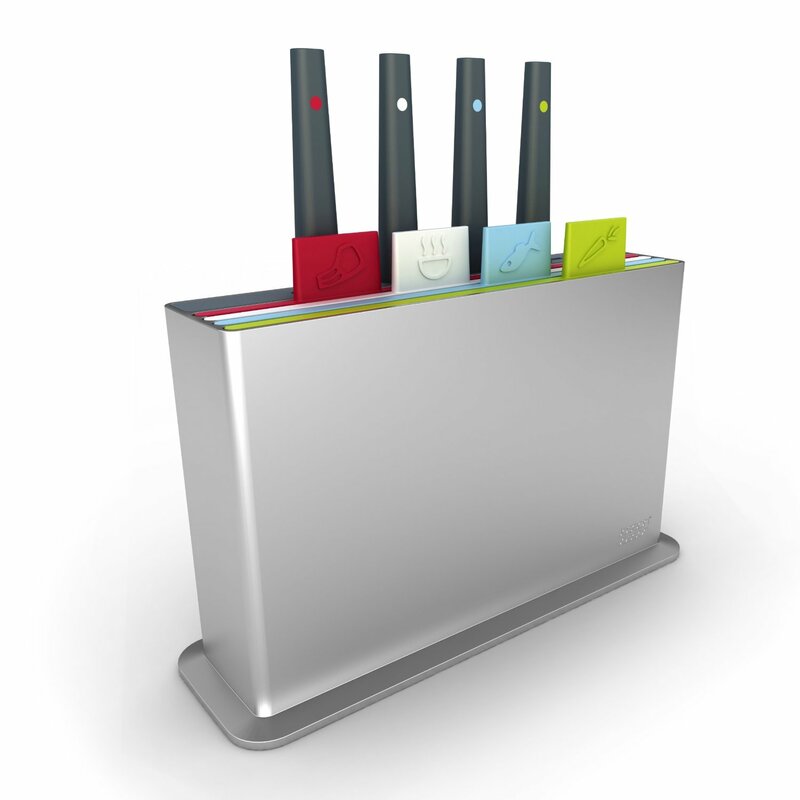 These cutting boards and their coordinating knives are labeled, much like an RSVP card: Chicken, Beef, Fish, Vegetable. 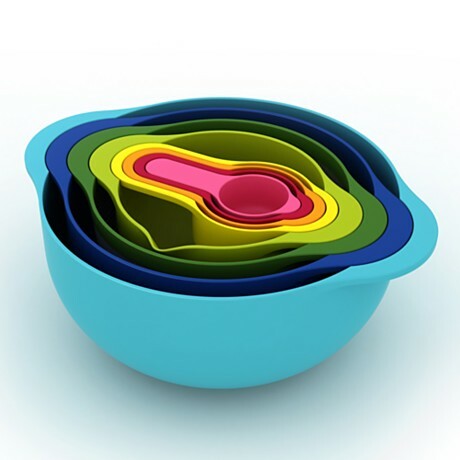 I have featured this set of bright nesting bowls before, but they are worth repeating. If you’re always juggling bowls, this could solve that problem. The piece de resistance! In a tower formation this carousel (of progress) keeps all of the necessary tools in a slim upright formation, that is easy to spin and find the needed tool. Also amazing is that all of the utensils on the carousel, as well as the ones in this baking set are “elevated” so that the sauces, frostings, ick and eew don’t transfer from pot to utensil to counter top. Genius! These fun little counter-top finds are available seemingly everywhere; take some time to shop around and find the best price. 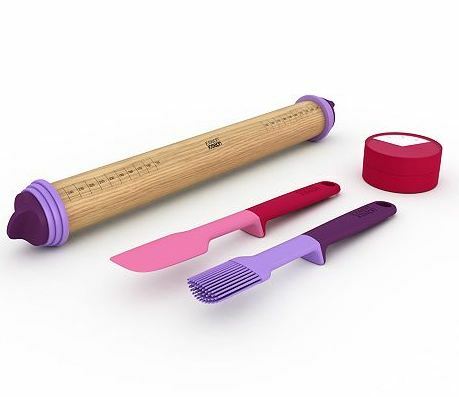 But, feel sure that these tools will delight the home cook, baker, and home design lover. This entry was posted in Her Home, Her Kitchen and tagged colorful kitchen gifts, colorful kitchen tools, home decor, housewares, joseph joseph, joseph joseph kitchen tools, joseph kitchen tools. Bookmark the permalink.